Breathtaking beach views, white sand and a tucked-away gem off the beaten path: if that adds up to your ideal getaway, join us here at the Emerald Isle. Okaloosa Island is a barrier island that provides an oasis of peace and tranquility between the two busy cities of Destin and Fort Walton. The waters of Santa Rosa Sound, Choctawatchee Bay and the Gulf of Mexico surround you on all sides, offering more sand and sun than you ever imagined. If your vacation mode is laid-back and slow-paced this is the place for you. These are the unspoiled beaches and crystalline sand of your Florida dreams. The stresses of daily life will drop with every sun-soaked step you take on the soft sand. On the island, local building codes limit the height of buildings, so all you see around you is sea and sky. You’ll feel like a castaway on your own private island. At the same time, summertime fun is right down the road. Fort Walton has one of the longest boardwalks in the area and you can stroll for hours exploring its shops, restaurants and nightlife. The boardwalk is also wheelchair-accessible. There’s a pier that’s lighted at night so your fishing fun never has to end. Volleyball nets, jet ski rentals, dolphin cruises and more are right down the road. Fort Walton is a charming seaside town with one-of-a-kind stores, art galleries and restaurants. Destin has great outlet shopping, along with hopping nightlife and an endless array of beachfront activities. If you’ve been craving good seafood, you’ll find it here. Okaloosa Island is perfect for nature lovers, as all kinds of sea life visit its clean waters and it’s not unusual to spot dolphins, sea lions or herons as you wend your way along the shore. For an unforgettable experience, try a nightime turtle watch where you can see nesting turtles on the beach. It’s part of a statewide effort to protect nesting turtles and is free. There’s so much to do you can try something new every day. 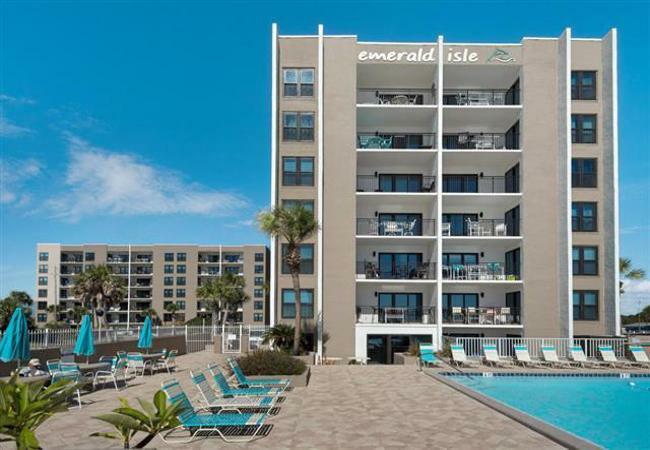 If you want to take “laid-back” to the max, at Emerald Isle you can do just that. Right on the resort you’ll find picnic and barbecue areas, outdoor showers, sunning decks, a heated pool, fitness center and tennis courts. We’ve made sure you’ll lack for nothing and enjoy every moment of your stay here. Each condo is beautifully furnished with large modern TVs and fully-equipped kitchens. Sweeping balconies give you amazing views of the water day and night. Every condo is outfitted with linens, cookware, ceiling fans, a coffeemaker and a washer and dryer. You’ll welcome family and friends in your spacious vacation digs, as these condos sleep six or eight people and have extra bathrooms. If you’re looking for treasure among Okaloosa Island condo rentals, your search is over. Come and claim this jewel as your own.